"If Everyday Was Like Christmas"
I absolutely love this picture! 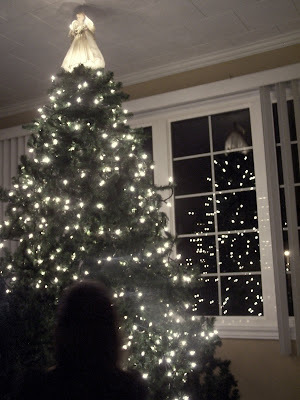 It was taken this weekend as my daughter was putting the lights on our tree. I was always very confident that I could easily define the word hero. That was of course "before" my husband became a cancer patient. Just last night, we both reflected on just how many MRI's and CT scans that he has had over these past few years, not to mention chemo treatments, blood tests, doctor's visits.....and the list goes on. Mentally, it takes a very strong person to keep going through all of these medical "musts" but an even stronger person when the odds are constantly being stacked against you. Continuous reports that indicate tumors are increasing, other medical issues that arise due to side effects and of course the never ending uncertainty that is ever present when test results are due, all increase a patient's stress levels to a point that a lay person could never comprehend. Yet, everytime I accompany my husband to the cancer clinic, I am always surrounded by cancer patients who appear so complacent. They always appear so pleasant and so eager to begin conversation with you, despite the anxiety that each must be enduring as they sit in the clinic awaiting their name call for chemo or radiation treatments, or for their doctor's appointment. I recently spoke with a patient who is awaiting major surgery to remove a cancerous tumor. He is presently undergoing treatments as well and is experiencing very harsh side effects from it. Despite all of his tribulations, when I ended our conversation, "I" was the one who felt so very uplifted because of his inspiration and positive outlook on everything. Truly amazing! Then there's the young woman who recently underwent major surgery to have cancerous tumors removed, only to receive a prognosis that her cancer is very aggressive. She continues however to be very positive for her family and friends and is determined to not accept the fate that her doctor has given her. Just spending a few minutes with her will definitely inspire those who doubt the courage of such a brave woman. Yes, the word hero can be defined in many ways and for many different feats that one endures in life. It is without a doubt though, that it's true definition lies unequivocalbly in every patient who is affected by cancer. great post today. I always say that "I never met a hero until my husband became one"